A team of four master's students from the Queen's School of Urban and Regional planning recently received the top prize from a contest hosted by the Canada Mortgage and Housing Corporation. Clockwise from top left: Lindsay Allman; Andrew Eberhard; Peter Huan; and Gabrielle Snow. The team, which earned the full award of $10,000 for their project Compact Homes: Innovative Solutions Solving the Affordability Challenge, included Lindsay Allman (MPL’18), Andrew Eberhard (MPL’18), Peter Huan (MPL’18), and Gabrielle Snow (MPL’19). The Queen’s team was one of only three top prize winners from across Canada. Ms. Allman says that “providing safe, affordable, and equitable housing for all is one of Canada’s greatest challenges.” The team’s CMHC project addresses that challenge by proposing “an innovative tiny home community” that leverages existing programs and unused sites in the city to produce homes at rents based on the incomes of single people struggling to find an affordable place to live. The team learned about the CMHC challenge in Patricia Streich’s housing course last term. Dr. Streich offered her students the opportunity to participate in the challenge as an option in her course to learn more about Canada’s new National Housing Strategy launched in 2017. Kingston was the project’s case study site, and the location is just one of the many innovative aspects of the proposal. The case study in Kingston is also groundbreaking in terms of housing affordability and financing. Compact homes are much cheaper to build than apartment buildings and constructing the homes on vacant sites reduces costs for homes where residents are close to existing city services. The units can be constructed to meet stringent accessibility, environmental efficiency and sustainability requirements. The experience of participating in the challenge and the sense of responsibility for creating affordable housing for Canadians is something that the team members will take with them as they move forward in their careers as urban planners. Ms. Allman says she intends “to continue to advocate for affordable housing” and that she hopes that post-secondary students continue to engage with CMHC to bring innovative ideas to life. For more information about the School of Urban and Regional Planning, visit the SURP website. For more information about the challenge, visit the Canada Mortgage and Housing Corporation website. The federal government unveiled an initiative Tuesday designed to pay tribute to more than 100 Canadian women. They come from coast to coast, from a wide variety of fields and disciplines, and from nearly every decade of our country's more than 150-year history. They are the Women of Impact in Canada, part of a new initiative unveiled by the Ministry of Status of Women as part of Women’s History Month. Minister Maryam Monsef visited Queen’s on Tuesday to unveil an online gallery which includes photos, stories, and quotes from prominent Canadian women. The gallery inspired the theme for this year’s Women’s History Month, which is “Make an impact”. Minister Monsef also encouraged the dozens present to go online to the Status of Women website to view the gallery, and consider submitting a name for consideration. She noted the gallery will continue to evolve, and hopefully serve as a valuable resource to educators. 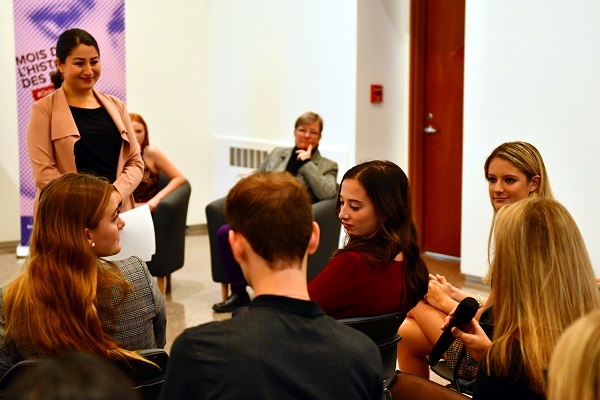 The ministry partnered with Queen’s Female Leadership in Politics (QFLIP) student group to host the launch announcement and panel discussion at the Agnes Etherington Art Centre. 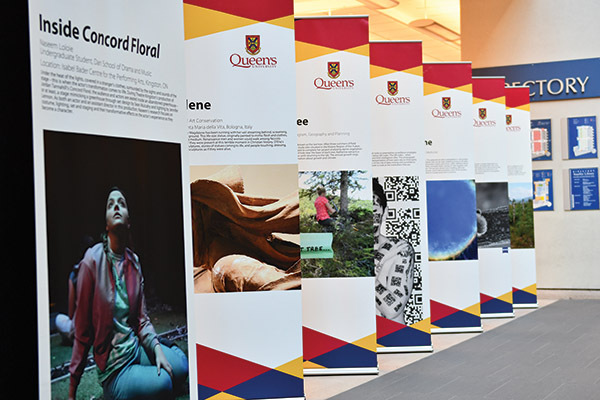 Queen’s has connections to 17 of the featured women of impact, including a number of honorary degree recipients. Read more about this event in this preview article in the Queen's Gazette. The Agnes Etherington Art Centre will host an announcement by Canada’s Minister of Status of Women on Tuesday. Editor's note: This event was originally scheduled for Monday, Oct. 1 and has been moved to Tuesday, Oct. 2. A number of Canadian women of impact will visit Queen’s next week, in a sense. To launch Women’s History Month in Canada, the Honourable Maryam Monsef, Canada’s Minister of Status of Women, will make an announcement at the Agnes Etherington Art Centre on Tuesday. She will launch a Government of Canada initiative called the “Women of Impact in Canada” Gallery – an online museum exhibit where Canadians can learn about and celebrate the accomplishments of women in fields ranging from science, technology, engineering, and math (STEM); arts; politics; human rights; and women who were trailblazers in new fields. Some prominent Queen’s women appear in the group, including Suzanne Fortier – the university’s former Vice-Principal (Academic) and Vice-Principal (Research) who is now the Principal of McGill University. Minister Monsef will be hosted by the Queen’s Female Leadership in Politics (QFLIP) student group. Co-chair Meredith Wilson-Smith and Frannie Sobcov were contacted by the Minister’s office earlier this week about the announcement. The Women of Impact gallery is a living initiative, meaning that Canadians can also nominate a woman of impact in their communities by completing a form on the government’s website. Elizabeth Goodyear-Grant, faculty supervisor for QFLIP, says she was “very excited and honoured” that the Minister will be launching the gallery and Women’s History Month at Queen’s, and believes the gallery is an important initiative. The unveiling of the online gallery will take place Tuesday. Oct. 2 at 10 am at the Agnes Etherington Art Centre, and the event is open to the public. Visit the Women of Impact in Canada website for a full listing of honorees. A new course featuring one of Queen’s University Library’s newest acquisitions – a hand-coloured 1493 edition of the Nuremberg Chronicle that is now part of the Schulich-Woolf Rare Book Collection – is opening its doors to the public for an upcoming class. Members of the Queen’s and Kingston communities are invited to join professors Sharday Mosurinjohn and Richard Ascough (Queen’s School of Religion) and their students for a lecture in Religion and Art (RELS 345) on Wednesday, Oct. 10 at 11:30 am at the W.D. Jordan Rare Books and Special Collections in Douglas Library. The event, and the Nuremberg Chronicle, will be introduced by Principal Daniel Woolf. In their remarks, Dr. Ascough and Dr. Mosurinjohn will explore multiple facets of the Nuremberg Chronicle, known as one of the most important and extensively illustrated books of the 15th century. For 15th century readers it was a chronicon – a history – made of text and image. As an artefact, the book embodies an important story, one of both the fracturing of Europe along socio-political and religious lines and its expansion through trade and exploration – aspects of the globalization we see today. Yet another story is that of the book itself, which has been around the world and in the hands of many owners and readers in its 500-year lifetime. The Queen’s copy is a stunningly beautiful volume in Latin printed by Anton Koberger on July 12, 1493 and hand-coloured in 1521 by its one-time owner Johann Kruyshaar of Lippstadt (1484-1555), better known as Joannes Cincinnius, a Westphalian humanist, author and scholar of considerable significance. It is a large first edition folio containing 1,809 woodcuts, ranging in size from small medallion portraits to large double-page maps. Joannes Cincinnius’ marginal notes are found intermittently throughout the text. While there are more than 1,240 extant copies of the Nuremberg Chronicle in Latin and 1,580 of it in German, not all are hand-coloured and of those many are not signed or dated. Joannes Cincinnius’ signature and annotations make this copy unique. Now, residing in a collection that is part of a vast network of galleries, libraries, archives, and museums, this book is not only treasured and protected but available for study as artefact, literature, and visual art. Indeed, the images of European cities, maps, portraits, and other illustrations, plus the graphic designs and printing, have made this book famous. “We’re delighted that our students have access to this inspiring book, and that we’re able to draw upon it in our course to connect ideas across disciplines and cultures,” says Dr. Mosurinjohn. The Nuremberg Chronicle was acquired thanks to a generous donation from renowned philanthropist Seymour Schulich. It is one of the recent additions to the Schulich-Woolf Rare Book Collection established by Mr. Schulich and Principal Daniel Woolf in 2016. The Schulich-Woolf Rare Book Collection combines more than 400 volumes from their personal collections. Mr. Schulich has also provided funds to enable additional acquisitions and exhibits, on site and online, with a goal of building and sharing one of Canada’s finest English rare book collections. RSVP online to attend the lecture. Learn more about the Nuremberg Chronicle at the Schulich-Woolf Rare Book Collection website. Lisa F. Carver is and adjunct professor in the Faculty of Arts and Science and Post Doctoral Fellow, SSHRC-funded ACTproject at Queen’s University. It has been a year to celebrate for the Faculty of Arts and Science. Increased enrolment numbers, combined with significant efforts made towards campus diversification, faculty renewal, and many more exciting initiatives are recognized and celebrated within the faculty’s 2017–2018 Annual Review. Making this year’s edition even more significant is that it marks Dean Barbara Crow’s first year at Queen’s University. The Faculty of Arts and Science Annual Review is available online. From increased collaboration with the Arts and Science Undergraduate Society (ASUS), which led to the first-ever career summit event, Life After ArtSci, to the introduction of a suite of recruitment initiatives to support a growing graduate student community, to continued work with our Dean’s Council of amazing alumni who help provide industry insights, the Faculty of Arts and Science made great strides in terms of improving the student experience. The 2018–2019 year will see a sustained and expanded focus on the faculty’s priorities: equity, diversity, inclusivity, Indigeneity, international student support, and graduate enrolment. In addition to these major priorities, there will also be new initiatives centred on research prominence, graduate student experience, and financial sustainability through revenue diversification. “At this time next year, we hope to have as many good news stories to share with you and I hope that you see the gains we are making,” says Dean Crow. The 2017–2018 Annual Review of the Faculty of Arts and Science, is available online. The new film highlights the things ordinary people can do in extraordinary circumstances. Emily LeDuc is a Doctoral Candidate and Teaching Fellow in the History Department at Queen's University. Joseph McQuade is a SSHRC Postdoctoral Fellow in the Centre for South Asian Studies, a branch of the Munk School of Global Affairs at the University of Toronto. The Conversation provides news and views from the academic and research community. Queen’s University is a founding partner. Queen's researchers, faculty, and students are regular contributors. The Conversation is seeking new academic contributors. Researchers wishing to write articles should contact Melinda Knox, Associate Director, Research Profile and Initiatives, at knoxm@queensu.ca. The Fall Policy Talks series opens with a personal look at the balancing act of a deputy minister. A packed room of School of Policy Studies graduate students and members of the Queen’s and Kingston community listened keenly to the stories and advice of Deputy Minister of Public Safety Malcolm Brown, the first speaker of the Fall 2018 School of Policy Studies “Policy Talks” Series. A Queen’s alumnus, Mr. Brown (Artsci’82) holds the most senior public service position at Public Safety, advising the Minister and acting as the connection between bureaucracy and politics. The department covers a large portfolio, including Correctional Services Canada, Canadian Security Intelligence Service (CSIS), Canadian Border Security Agency (CBSA), Parole Board of Canada and the RCMP. Mr. Brown spoke about the role he plays in public policy and the relationships he manages to keep the portfolio running efficiently. The School of Policy Studies hosts Policy Talks, a weekly series that covers a broad range of policy topics. Mr. Brown’s opening talk for the series gave the audience a look behind the scenes of one of Canada’s most high security departments. “I report directly to the Clerk of the Privy Council Office and support the Minister, and I manage the relationship between the Minister and the department,” says Mr. Brown. “Deputy Ministers need to understand their Ministers to make this work. Figuring out how my Minister works and takes in information is crucial. If you don’t work together properly, you both operate in a vacuum. Audience members peppered the Deputy Minister with questions after his speech, including what it takes to be a leader in federal government. Many of the talks will be livestreamed this year. For details on this and upcoming Policy Talks, visit the School of Policy Studies website.